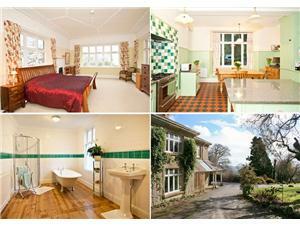 WITH PANORAMIC VIEWS ACROSS UNSPOILT COUNTRYSIDE. HAZELWOOD HOUSE STANDS WITHIN ITS OWN LANDSCAPED GROUNDS WITH A PROFUSION OF RARE TREES, PLANTS AND SHRUBS COLLECTED BY PREVIOUS OWNERS AND EXTENDS TO ABOUT 65 ACRES. 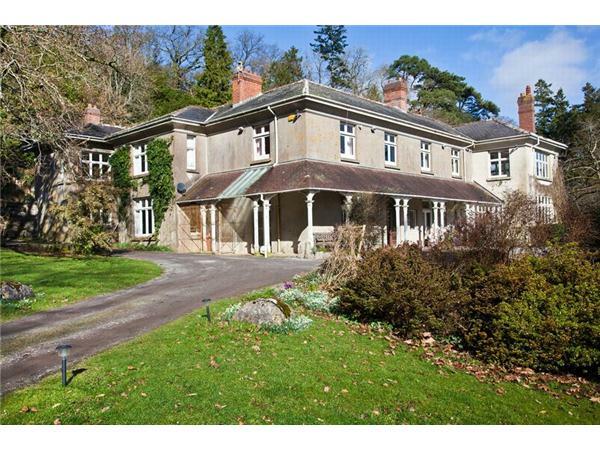 Hazelwood House stands in its own land, in a commanding position on the edge of the village of Hennock enjoying views to the south over its own parkland grounds to the panorama of South Devon beyond and is a fine example of a Victorian Gentleman's Country Residence. The property, which was the subject of a major rebuild in the late nineteenth century offers spacious, well planned accommodation. Throughout, its character has remained unblemished and in the principal rooms many of the original features have been preserved. These include fine fireplaces of granite, Portland Stone or brick with intricately moulded timber surrounds and ornate plasterwork to ceilings. In the Billiard Room the warm colours of its pine ceiling with heavy moulded beams and timbers complement the pine parquet floor that is complete with the inlaid wrought iron gratings that were possibly part of the original heating system. 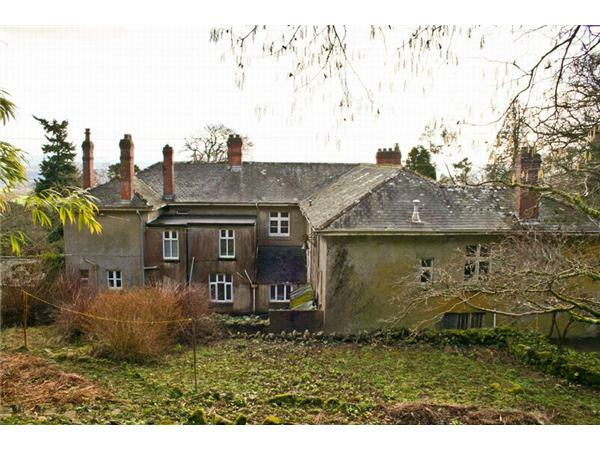 The rear of the house comprises the former servants' wing which remains largely unaltered since it was built and offers potential as a self contained unit or annexe. Construction is of local Blue Elvan stone and brick, cement rendered beneath a slate roof with a tiled area over the Verandah to the front and side. 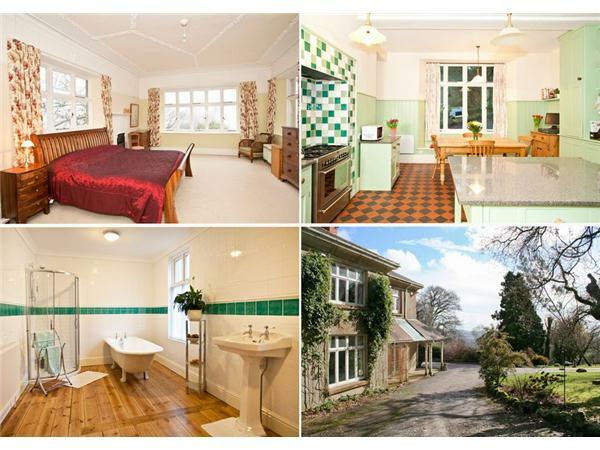 Hazelwood House is set at the head of its own drives in walking distance of the village of Hennock and stands some 600 feet up on the slopes of the picturesque Teign Valley. Hennock is an active community with its own Primary School , Church and Village Inn. The moorland town of Bovey Tracey is within about 2 miles and offers a wide range of shopping, business and medical and educational facilities. The A38 Devon Express way is about 3 miles distant with the market town of Newton Abbot (8 miles), Exeter (15 miles) and Torquay (15) all in easy reach . Entrance Hall. Polished Oak flooring, radiator , ornate moulded ceiling and cornice work, picture and dado rails. Drawing Room 4.2m x 3.6m finely carved fire surround (which is believed to have originally come from Shiphay Manor, Torquay) open grate and glass fronted cupboards on either side. Ornate moulded ceiling and cornice work. Radiator, part panelled walls, 2 French windows with doors opening to the verandah front and side. Dining Room 5.9m x 4.53m polished pine floor, part panelled walls. Arched brick fireplace, matching hearth with dog grate with glass deflector and timber mantle shelf over. ornate moulded ceiling and cornice work. French doors opening to the verandah. Billiard ? 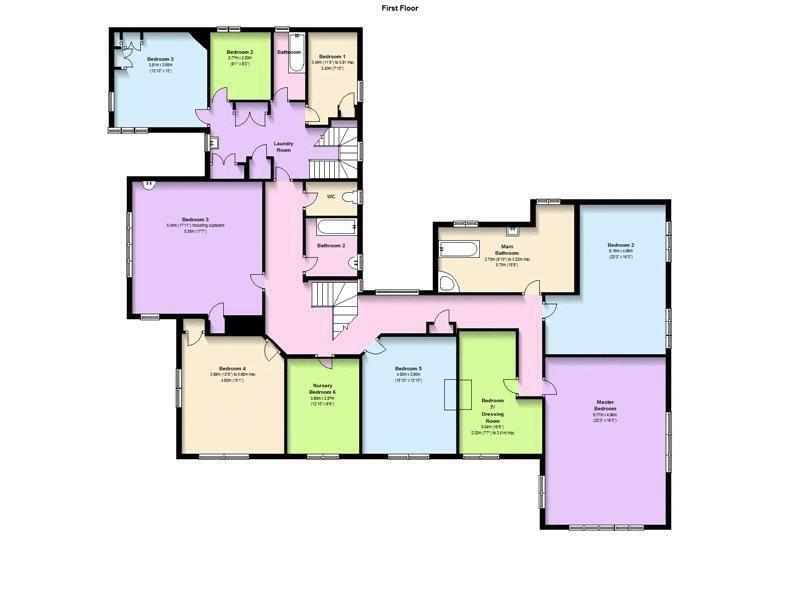 Games Room 9.47m x 8.52m max L shaped. Believed to be a later addition to the property. This room features a fine pine ceiling with moulded beams and cross timbers together with timber panelled walls, picture rail. Pine parquet floor with ornate inlaid wrought iron gratings which were part of the original heating system. 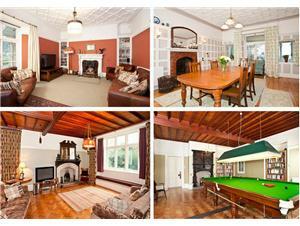 The room is laid out in two distinct areas of 'Billiard Room' and 'Sitting Area. The Sitting Area has a granite fireplace with carved Portland Stone surround and timber overmantle with inset mirror. Radiator. Deep window seat beneath a Mullioned Portland Stone window overlooking the grounds and countryside to the front of the property. The Billiard Room area has a second granite fireplace and hearth with an ornate heavily carved Jacobean style timber overmantle, two recesses for bookshelves, two radiators, second window seat to side window looking to the walled garden. French windows opening to Sun Room 3.68m x 1.54m with tiled floor, views over the grounds to the front of the property. Separate toilet Original WC and high cistern, with brass pull finished with a china finial. Rear Lobby Part glazed door to Laundry Room 7m x 2.68m with 1 1?2 bowl sink unit, pine laundry cupboard with cupboards and drawers under. Marble cold shelf, radiator, 2 uPVC double glazed windows. Hatch to dining room. Pantry 3.51m x 1.96m Range of pine shelves, recessed uPVC double glazed window. Former Servants' Quarters Wide entrance door, quarry tiled floor. Scullery 3.28m x 2.68m Deep clome sink (h&c) Central heating boiler for this area of the house. Airing cupboard with lagged copper cylinder. Door to Separate Toilet. Meat Larder with original meat hanging rail. Sitting Room 4.2m x 3.6m Corner fireplace with wrought iron grate and tiled surround. Parquet flooring. Radiator. FIRST FLOOR approached from the main hall by an easily ascended wide staircase having fine quality mahogany ballusters and hand rail. Half Landing with leaded light window and rose stained glass border. Main Landing Two radiators. Medicine cupboard. Window with deep sill and leaded light window and rose stained glass border. Master Bedroom 1 6.77m x 4.96m Large window will deep sill overlooking the grounds. Two side windows. Ornate moulded ceiling and cornice work. Wrought iron fireplace. Radiator. Picture rail. Window overlooking the front of the property. Radiator. Wrought iron fireplace. Bedroom 3 6.16m x 4.96m max Hand basin (h&c) Radiator. Two windows overlooking the walled garden. Coved ceiling. Wrought iron fireplace. Bathroom 1 Polished pine floor. Island bath. Pedestal hand basin. Radiator. Low level WC. Corner shower unit with curved glass doors. Fully tiled walls. Nursery Bedroom 5 3.91m x 2.97m Fireplace. Casement window overlooking the grounds. Bedroom 7 5.35m x 4.90m Built-in cupboard. This room features a most unusual wrought iron fireplace displaying the date 1897, with folding wrought iron doors with tiled insets that open to allow the wrought iron fire cover doors to be folded away and concealed. Hand basin (h&c) Second built in cupboard. Window with deep seat, enjoying views over the front gardens. Second window with views over the grounds to the side of the property. Bathroom 2 Antique heavy enamelled bath (h&c). Hand basin (h&c) with Clome sink behind. The walls are half tiled with original tiling with ornate moulded top string. Ornate moulded ceiling. Separate WC Original half tiled walls. Low level WC. Ceiling with moulded plaster work. Landing Pine store cupboard. Deep clome sink with chamber pot emptying facility. Additional pine store cupboards. Ladder giving access to the roof void?loft area over. Bedroom 8 3.93m x 3.65m Corner wrought iron fireplace. Built in corner store cupboard. Hand basin (h&c) Dual aspect windows. Radiator. Bedroom 9 2.77m x 2.49m Hand basin (h&c). Wrought iron fireplace. Radiator. Deep window sill. Bathroom 3 Cast iron bath (h&c) Radiator. Bedroom 10 3.81m x 2.4m Built in cupboards. Wrought iron fireplace. Hand basin (h&c). From the Servants' Hall area there is a door leading to a Courtyard giving access to the Boiler Room with a Worcester Oil Fired Central heating boiler. Coal Shed 8.23m x 2.97m stone walls under slate roof, divided into 3 sections. Opposite there is a Stone Barn Known as Hazel Cottage 12.5m x 7.47m stone walls with granite arch doorways, to two sections. The roof has been recently refurbished with new timbers and slates. 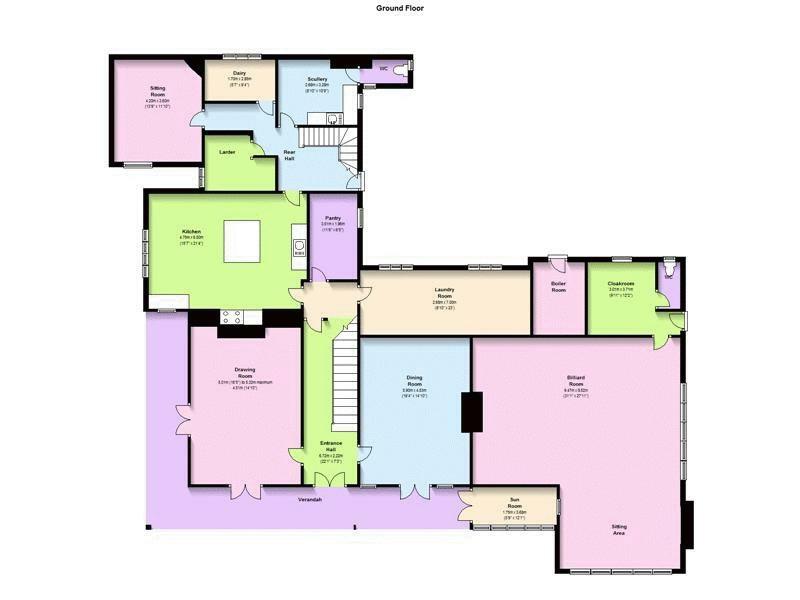 The building would be suitable for a number of purposes, subject to planning approval. Attractive feature fireplace. Former Kennels/Stables 9.45m x 4.57m Stone walls with red brick floor under slate roof with clay ridge tiles. Two pedestrian doorways to an area which currently is used for stabling, wooden framed windows. Situated beside the former tennis court is a Storage Shed 7.32m x 3.81m timber construction with timber sides under tile roof with wooden doors to the front. Back drive that leads to a Hard Standing Yard Area with: Modern General Purpose Building 18.29m x 6.1m concrete block walls and pillars under a Galvaprime roof with two doorways and some parts timber clad. Concrete floor. 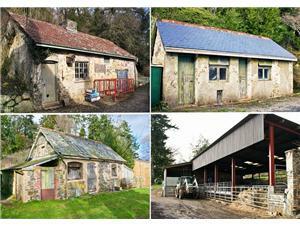 Adjoining Building 6.1m x 3.66m of the same construction split into two conveniently sized pens with galvanised gates. Modern Livestock Building 17.83m x 9.14m Steel portal framed building with part concrete block walls and floor throughout, under fibre cement corrugated roof with sky lights. To the end is a Storage Area 13.41m x 4.27m raised to a higher level and built of the same construction the area has a separate entrance through a pedestrian timber doorway or a convenient loading area for unloading lorries. Traditional Building 8.23m x 4.72m Trusham blue granite and Candy brick walls construction under a slate roof with feature clay ridge tiles. Pedestrian doorway to a stone sets floor with two sections. Lean to both ends 2.36m x 4.72m. The gardens and grounds beside and in front of the house include grassy areas, the front garden and a part walled kitchen garden. There is a former grass tennis court, also gardens and grounds with numerous trees and plants much of which has been allowed to naturalise and forms a wild life haven. Beside the entrance drive are gently sloping paddocks and to the east a service entrance drive. In all, approximately 15 acres. Private water supply, Septic Tank Drainage, Mains electricity. we understand from the Vendors that Broadband is available. This land would make a very useful addition to Hazelwood. A schedule of the land is available from the agents. The adjoining farmland, edged in red, extends to 50.24 acres and consists of about 28.22 acres of pasture and 22.02 acres of woodland. Access to this land is from Council roads and by a track from Hennock which is shown green on the plan. The owners have recently erected a modern building of steel construction with galvanised coating under a fibre cement roof. The building measures 30.48m x 15.24m and has a hard standing area.